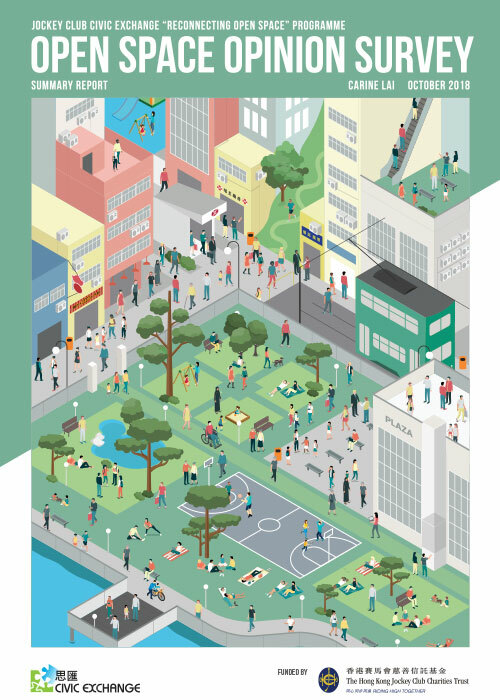 Civic Exchange conducted a public opinion survey of 3,600 Hong Kong residents across 18 districts on the quality of open space between January and February 2018. The goal is to develop evidence-based recommendations to inform policies on the planning, design, and management of open space as envisioned in “Hong Kong 2030+: Towards a Planning Vision and Strategy Transcending 2030”. About 85% of Hong Kong residents visit open spaces at least once a month. An overwhelming 97 per cent of respondents use open spaces near their homes. Only 15 per cent go to open spaces near their workplaces. Sha Tin and Southern residents are the most satisfied with the quality of open spaces in their communities, while Wan Chai and Yau Tsim Mong residents are the least satisfied. Southern District has the highest level of waterfront usage in Hong Kong, with about half of the respondents making a visit at least once a month. Almost half of all respondents want more shared cycling and jogging paths, shade, places to sit and chat, and lawns in their neighbourhoods. Three in four parents want more open spaces for their children to ride bicycles and scooters; about half of them ask for interactive natural environments and adventure playgrounds. More than 50 per cent of 16 to 29-year-olds ask for more barbecue pits and multipurpose exercise spaces in their neighbourhoods. There is a noticeable demand for photogenic and comfortable hang-out areas as well. About 58 per cent of the elderly want better safety features such as hand rails, non-slip paving, and better lighting to make open spaces more elder-friendly. A companion study combining geospatial analysis with data from the opinion survey found that people who live closer to parks and open spaces smaller than 1 hectare are more likely to report less anxiety. The findings also revealed that proximity is more relevant to usage than the total amount of open space available near people’s homes. Survey respondents who visited open space more frequently reported feeling happy more in the two weeks preceding the survey, although it was unclear if they were happier people to begin with, or whether frequent visits made them happier.